House-cured bacon made from the Pee Dee's own Carolina Heritage Farms pork. Tender sweet coppa. Rich, local Roma tomatoes from Old Coots Produce. Fresh mixed greens. Finished with our signature white sauce, whole-milk mozzarella and a dash of Lowcountry smoked olive oil. The August Rebel Pie of the Month is what the best summer BLT sandwiches dream of being when they grow up. Available now through Saturday, August 30. 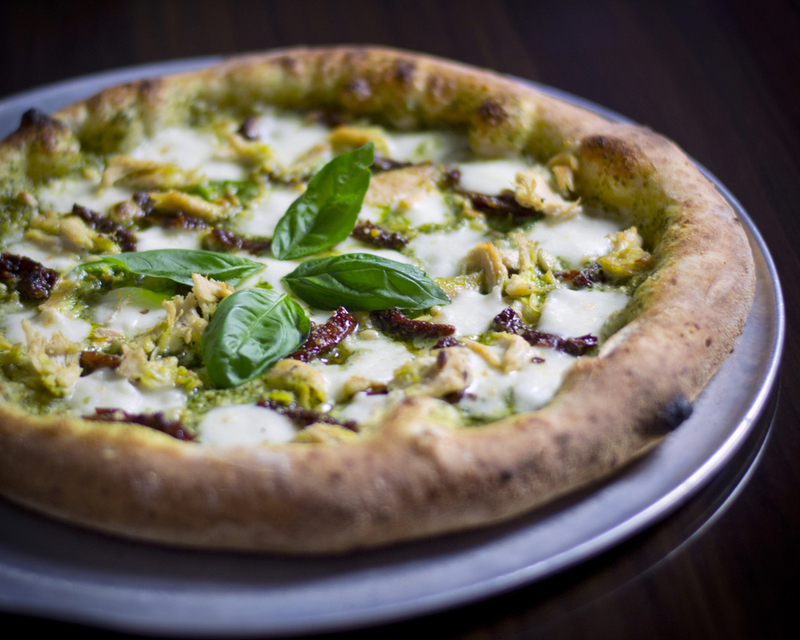 With housemade basil pesto sauce, chicken, sundried tomatoes, pine nuts, fresh whole-milk mozzarella and romano cheese, a spicy hint of fresh-sliced jalapeño and a garnish of fresh basil, the July Rebel Pie of the Month is out to make all other pizzas green with envy. Available now through Saturday, August 2nd. Housemade fire-roasted sweet corn and organic black bean salsa, local chorizo sausage from Carolina Heritage Farms, signature red sauce, fresh whole-milk mozzarella and feta cheese get together on our June Rebel Pie of the Month for a fiesta of summer flavor. Available now through Saturday, June 28th. Marinated artichoke hearts, fresh spinach, crispy pancetta, fresh whole-milk mozzarella, creamy signature Béchamel white sauce, pecorino/romano cheese and freshly ground black pepper blend seamlessly to make May the smoothest Rebel Pie of the Month yet. Available now through Saturday, May 31st. We are excited to announce that Florence's very own Seminar Brewing is now available at Rebel Pie. The light and refreshing Rye Smile Rye Beer and dark and smooth Crow Foot Wheat Stout are now on tap—our first draft beers ever—and proudly take their place in our extensive lineup of Carolina craft beers. Florence's own Seminar beer and Florence's only wood-fired pizza, together at last at Rebel Pie. Why wait for Cinco de Mayo to heat things up? With coastal Carolina shrimp from Our Local Catch, fresh sliced avocado, tomatoes, purple onion, fresh cilantro, a dash of Lowcountry habañero lime olive oil and optional jalapeños, the April Rebel Pie of the Month will give Spring a much-needed kickstart. Available now through Saturday, May 3rd. With sweet Peppadew peppers, spicy local andouille sausage from Carolina Heritage Farms, Kumato brown tomatoes, toasted fennel seed, crushed red pepper and a drizzle of chili pepper oil, the March Rebel Pie of the Month can't decide if it wants to be sweet or sassy. So we say why not be both? Available now through Saturday, March 29. Start the party early with our our Mardi Gras inspired February Pie of the Month. Local andouille sausage from Carolina Heritage Farms, blackened shrimp, crisp bell pepper, sweet caramelized onion, crushed red pepper and a healthy dose of cayenne pepper sauce will make you reach for a cold one to put out the fire, and then come right back for more. And if your tastes run even hotter, splash on some of the Frank's Red Hot sauce that accompanies every pie. Available now through Saturday, March 1. With spicy fresh arugula leaves, seasoned and salt-cured prosciutto, crisp purple onion, extra-virgin olive oil and fresh rosemary, our January Pie of the Month will make you forget the deep freeze outside and wish January lasted longer than 31 days. Available now through Saturday, February 1.